Rapid set single-part flexible adhesive for fixing all types of ceramic, porcelain tiles and mosaics and moisture stable natural stone. Suitable for plywood overlaid floors installed to British Standard recommendations. 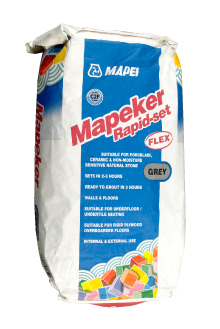 Use with undertile heating encapsulated in a levelling compound. For internal and external use on walls and floors. Cured adhesive is water resistant and frost-proof.